Pros: It is portable, comfortable and durable. Cons: The material and mattress of this crib can only be hand-washed. It is suitable from birth to 2 years old. The Valco Baby Zephyr Travel Crib is an ideal crib for those who want a crib that is comfortable, durable and safe to use. It assembles and dissembles in moments and comes with a fitted carry bag. The following video shows how easy this crib is to set up, put away and transport. When assembled, the base of the crib is 37 x 22″ and the top is 34 x 21″. It is 24.4″ high. The breathable mesh on all sides allows for a view of the child with the bottom part being blacked out to help baby go to sleep. Families who want a simple but compact and durable travel crib that will allow them to travel anywhere easily with their baby or young toddler for a reasonable price. This travel crib is similar to the BABYBJORN Travel Crib without the high price tag. It comes with a fitted carry bag, mattress, instructions and an insect mesh. The Valco Baby Zephyr is one of the easiest cribs to assemble and collapse. Within moments, the crib is set up and ready for use. The instructions on the manual are clear, simple and straightforward. There are no added tools or batteries required for the crib to operate. Once the crib is upright, all you have to do is add the mattress. Because of its small dimensions, it is ideal for use in rooms that may not have a lot of space. The fabric of the mesh can be easily removed, and cleaned. The same goes for the mattress cover. They need to be handwashed. The mattress is not waterproof. Our Valco Zephyr review found a compact and easy to carry around crib when folded. It is one of the heavier travel cribs at 13.8lbs and it folds down to 23 x 20 x 3″. It come with its own bag, making it easy to carry around the home or the world. It can easily fit into any suitcase or travel bag. It comes inclusive with a padded mattress that is soft and easy to fold when putting away the crib. 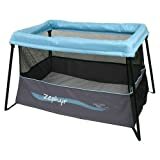 You do not have to worry about traveling to a place with a lot of mosquitoes as this crib comes with its own net included. 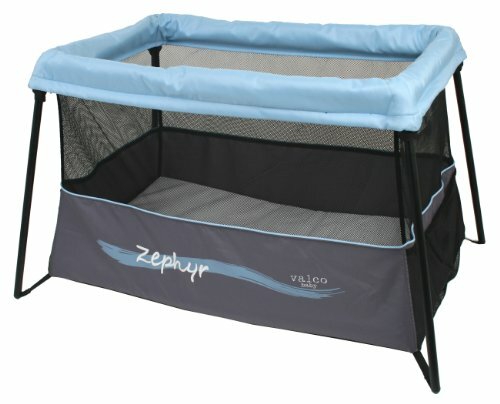 The Valco Baby Zephyr also comes with an exterior that allows for extra airflow. This ensures that whilst inside the crib, your baby will have access to cool and fresh air and will not feel stuffy and uncomfortable. 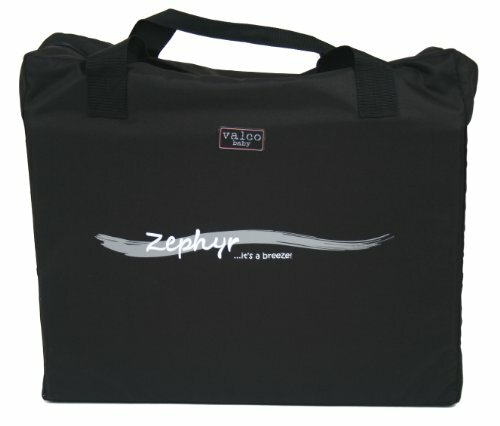 The Valco Baby Zephyr has no weight restrictions but it will only fit children until they are about 36″ long. For this reason, this crib is suitable from birth until the child is about 2 years of age. It meets all safety standards and is durable and sturdy, providing a solid frame once it is set up. Your child will have no problem playing and sleeping in it. The sides of the crib have mesh fabric windows, making it easy to see inside the crib to check on your baby. The crib has mesh pockets on the side that are ideal for storing toys or sleeping material for your baby. It comes in a variety of styles and colors, offering you a chance to choose one that’s better suited for you. You can choose between storm (black and white) and blue. You can also buy fitted sheets specifically manufactured for this travel crib. Though both the material of the crib and mattress can be removed, they can be hand washed only. It is only suitable until your baby is about two years old. The Valco Baby Zephyr Travel Crib is durable, comfortable and easy to assemble and dissemble. It is best for parents who want a travel crib similar in style to the Baby Bjorn Travel Crib Light 2 without the big price tag.